Due to recent illness I needed to drive to do some errands which I would usually ride to do. So I found myself driving round town during perfect autumn cycling weather. As I was driving through areas which I would usually ride through, I felt a mild irritation, no doubt partly fuelled by the infection affecting my system, but also by the conditions I had to drive through. Having to search for car parks, sometimes pay for parking, then walk distances to my ultimate destination annoyed me. Then there is the traffic. Newcastle’s traffic is not well regulated in that traffic lights are not synchronised with each other and it is not unusual to be sitting at lights for long periods of time with no cars actually driving through the intersection. Likewise, it can sometimes take two or even three light changes to be able to get through some intersections, especially when doing a right turn. These things probably add to the driver culture here which is not one of great orderliness and mild road rage is often the order of the day. It is unusual for cars to let you in if your lane on the left of the road runs out or is blocked by a parked car or a stopped bus. All these things contribute to the driving culture in Newcastle, which is generally not a great one. Having people yelling out their windows at riders for no reason other than to scare or intimidate is not good. And car drivers do not save their bad behaviour for just cyclists – other car drivers are targets too. Some of these problems could be fixed with infrastructure improvements. If steps were taken to facilitate the better flow of traffic, I am sure the rest would improve as the general level of frustration on our roads reduced. 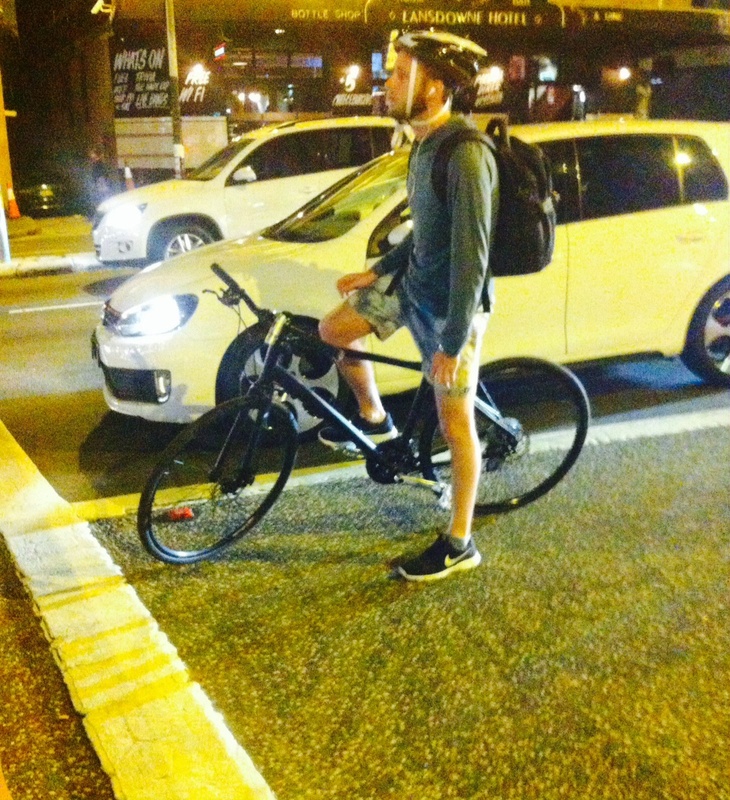 This entry was posted in Uncategorized and tagged infrastructure, newcastle, street cyclist, traffic. Bookmark the permalink. I feel your car driving annoyance. If I have to drive for extended periods I notice my speed and irritation increase. To locate parking, especially in our tight knit downtown core, is a test in patience. it’s not surprising we prefer riding a bike. Mild road rage is common everywhere, I have the choice and I don’t need a car: I am lucky. I remember a tip which can alleviate stress: music. It’s impossible (IMO) to listen when you ride a bike because focusing is so important, nevertheless, in a car, with a smooth tone level it can be acceptable. I hope you enjoy it and get rid of illness. Very soothing music! Yes I’m getting better now. Novocastrians are spoilt/encumbered with a road system that was designed for much heavier use. It’s streets are similar to its heavy rail line, ie. a legacy of its industrial past and arguably a bit of overkill in some places. And there’s been some bad recent transport planning, and the lights don’t sync (making a trip from Nobbys to Hamilton take over 20 mins in peak hour), but the point I’m getting to is that Newcastle doesn’t really have bad traffic as it has an over abundance of arterial roads and shortcuts – at least when compared to a lot of the other cities that we like to compare it to. Drivers in Newcastle don’t know how to drive in traffic or how to cope with even minor delays – because they’ve never had to learn to deal with such things. Just like how people who get the train or bus around the city rarely have to stand or queue to get onboard. The overall result I believe is more bad behavior on the roads when there is traffic (or cyclists) than you’d get in other places – although, I’d still rather be a cyclist or motorist in Newcastle than Sydney. Steve, I agree with every single point you make, in fact, it is the experience I’ve had of living in Sydney for eleven years and spending up to 2.5 hours a day commuting on the roads there that informs a lot of my thinking about how things could be better on Newcastle roads. I agree that many novocastrians don’t appreciate how good we’ve got it here too! Thanks for your very informative comment.